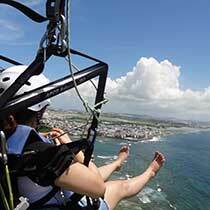 Flying up to a height of 200 meters, looking down the blue ocean and coral reefs from the sky is a marvelous experience! 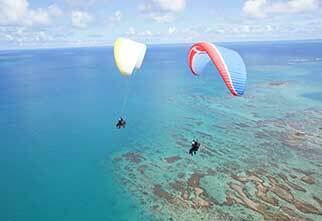 Simultaneous flight for three is possible.A skilled instructor will ride on the paraglider with you and assist your safe flight. May witness sea turtles and ray fish if you are lucky! ※The Meeting location will be decided in the morning (around 9AM) of the designated activity date. Please call the store directly to confirm the meeting location. ※English-speaking staff will address you. ※Please be sure to arrive at the meeting location at least 10 minutes prior to the departure time. ※Closed for staff training (May 20th-22nd, 2016). 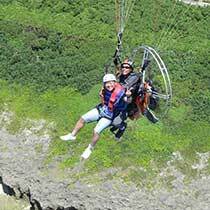 7 years and older： ￥10,000 per person. 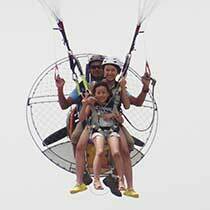 3～6 years old： ￥8,000 per person. ※Those who are under the medical treatment for chronic disease or pregnant cannot participate. ※Please notify us of your cancellation beforehand. ※Schedule is subject to change/chancel according to weather condition.